If you live in Southwestern Ontario look in your garden and you will see another of spring’s gifts – rhubarb. 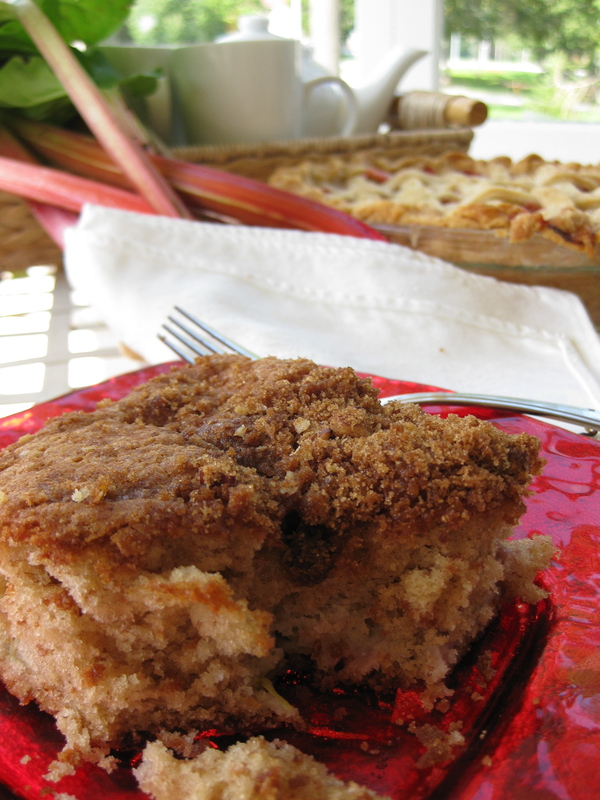 It is ready to cut….. and….. my favourite Rhubarb Coffee Cake works equally well with gluten-free all purpose flour! Thank you, again, Jayne for sharing this recipe with me. I am still looking and working on a muffin to take the place of my old reliable wheat version so if you have one that works I would love to try it out myself. The photo above is the version made with wheat flour and if you are able to use this just substitute 1 cup of whole wheat and 1 cup of all purpose flour for the GF flour and omit the xanthan gum. I used this photo because I could not do as nice a job as Nick did when he did the pictures for the cookbook and the cake does not look significantly different made with GF flour. Already my husband, Cliff, is asking for rhubarb pie and luckily we can do that without wheat too. I just have to decide which one to make, strawberry rhubarb or rhubarb custard? If the weather turns us back indoors I will post a photo and recipe next week! Let me know if you have a preference for one of the pies. Beat margarine and sugar until light then add eggs one at a time. Stir in applesauce, yogurt and vanilla until smooth. Sift together flour, xanthan gum and baking soda and stir into batter until combined. Add rhubarb and beat a minute or two. Pour into a greased 9 x 13 inch pan. Add nuts if desired and sprinkle over unbaked cake batter. out clean and cake is pulling away from the sides of the pan. This entry was posted in Gluten-free Adaptations and tagged Anne's Favourites, celiac, gluten-free, rhubarb, rhubarb coffee cake by Anne's Favourites. Bookmark the permalink.